With the recent changes and improvements in home lighting technology, there is a lot of talk about energy efficient home lighting applications, mainly LED and CFL solutions are the most popular. LED lighting has evolved into a viable solution that provides long-term energy savings and aesthetically pleasing light output. Replacing recessed lighting fixtures with LED sources is an easy way to create beautiful ambient lighting with energy saving benefits. Available in a variety of sizes, recessed LED fixtures contribute to a sleek, contemporary environment with minimal intrusion. You can pair recessed fixtures with other sources like pendants, chandeliers, and sconces to account for general, ambient and task illumination. LED sources can add visual interest to any room of the home through accent illumination, LED accent lights such as step lights and surface mounts can be used to highlight visual features of a room, while enhancing the safety and security of the space. With the importance of energy efficiency on the rise, more decorative fixtures incorporate LED sources. Homeowners are now able to create fixtures with completely new form factors, without the constraint of a bulb. LED fixtures designed for task applications, such as under cabinet lighting, offer an easy way to enhance work areas. These lighting applications can be used to brighten kitchen counter spaces and improve functionality to complete everyday tasks such as preparing meals or reading recipes. CFLs are also a cost-effective and efficient option for homeowners. Like LEDs, CFL fixtures reduce maintenance and use less energy than traditional sources. Although CFLs improve efficiency, the color consistency and spiral shape of the lamp often deter consumers. However, there are many new and attractive options in CFL lighting available that will fit well with most any decor and application. 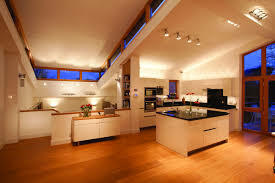 The lighting you choose for your home can completely change the look and feel of any room in your home and with the new technology available in home lighting there is a cost-effective, efficient and attractive solution to any home decor application. Lighting is so important! I use decorative lights (white or soft yellow) in the winter to add to the lighting in my home. Thanks for the article! Thank you for your input. Now that you bring up the importance of lighting, while I was writing this article I couldn’t help thinking about how important lighting is to our health. I’m an outdoors type of person and I work at home as a writer so there are times if I’m under a deadline where I may stay in working in my office for a couple of days. Especially in the winter months, I find myself getting kind of bummed out so I need to take a break and go outdoors for a while, then I’m reenergized and even more creative. That is why I moved my desk so it faces directly in front of a window in my office. Do you feel this way? Does anyone else? I know you were talking about the effect lighting has on your home which can make or break a lot of home decor, but I think the health issue is important too. I totally agree. I have lots of windows in my home, but during the winter when the light is muted by the clouds, I need more. More indoor lighting and more sunshine from outdoors. It is a real component in my physical and mental well-being. Yes, me too. I meant mentally and physically. It’s funny but I guess it’s something our bodies need. I read an article once about the importance of natural light to our mental and physical state maybe I’ll write my own.